Following the publication of a long blog post titled "Operation Golden Lily and the Treaty of Versailles!" about the seizure of $134.5 billion in “counterfeit” US bearer bonds in Chiasso (Italy, June, 2009), I was contacted by an intermediary who "works in China for the owners of this type of bonds." For the purposes of narrative, I shall call him "Mr. Yang." I read with great interest your posts on 1934 Treasury bonds, actually I work in China for owners of such bonds and I’m officially mandated to negotiate them. By the way, I have got some very interesting information that match partly yours. In this case the U.S. Treasury is totally in bad faith and does not answer any specific question about the bonds, even if today the existence of such bonds is known to Chinese authorities... but Americans are now unable to repay sums for trillions of dollars! " "I sent a message to the U.S. Treasury with attached pictures of the bonds, and they said they didn’t open my message for fear of viruses! I then faxed the same stuff, but they did not return answers to any of my specific questions." We have received further confirmation from our agent that the U.S. Federal Reserve had never issued bonds for amounts exceeding $ 100 000. This confirms that the bond you presented to our Bank on September 18, 2008 is fraudulent. Thus CBFA (Banking, Finance and Insurance) confirmed our obligation to retain the bond. So it took more than 2 years to the Bank to give Mr Yin the same information as that shown on the website of the Fed! 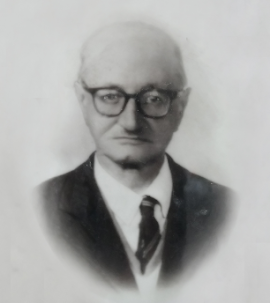 Which is in any way a false assumption, since very-high-denomination Treasury notes (of $100 million and $500 million) have surely been issued, as stated by Dr. Franklin Noll in his presentation at the 2005 Annual Conference of the Economic History Society at the University of Leicester. Despite of the fact that Mr. Yin had always acted with the utmost transparency and had contacted himself the U.S. authorities, since the story of its bond is a little bit different from those of Chiasso: he inherited it! Also, please know that in many countries, there is a rumor about lost boxes issued by Federal Reserve Banks such as the Federal Reserve Bank of Richmond or the Federal Reserve Bank of Philadelphia, allegedly in connection with the Treaty of Versailles. The “boxes” have a maturity period of over thirty years and high annual interest rates. It is said that some of these boxes were found in the Philippines after WW II. Invariably, the typical “box” contains millions or billions of U.S. notes, bonds, gold bullion certificates, treasuries, other non-existent securities, insurance certificates, green cards, etc. which shows that it is a set identical to that of Chiasso (series # D 04144945 A vs. D 45183601 A - D 45183850 A): "The Secretary of the Treasury acting on the instruction of The United States of America issues these bonds to the amount of $ 500 000 000 for all debts, public and private redeemable for the period of 30 years with an interest rate of 4% per annum." This is absolutely true, I know about some Banks retaining the bonds: at first they receive you with the red carpet, then it is impossible to have any information back, and I was myself victim of veiled threats: "Forget it, it is in your interest!" So what!? Do you think a forger would contact directly the U.S. Treasury by identifying himself, just for the pleasure of getting caught? 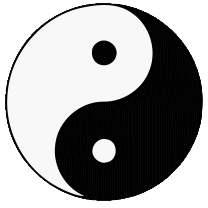 But if Mr. Yin & Mr. Yang aren't yet in jail, it means that these bonds must be real! 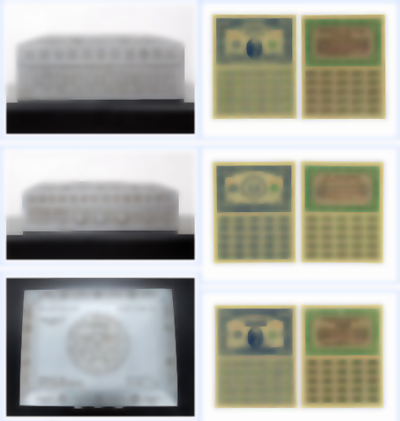 I saw several kinds of bonds, and these ones appear to be old and very highly qualitative, with watermarks and with some secret points which are visible only with ultraviolet lamps. In the Chiasso financial smuggling case (strangely, the official release of seizure is no longer online at Italian Customs website...), Colonel Rodolfo Mecarelli, Provincial Commander of the GDF in Como, stated that the $ 500 million bonds were also "made of filigree paper of excellent quality." So it's all a fake! Word of Expert of U.S. Secret Service! But if we take their word as solid gold, it also must be admitted that more than half of a century ago forgers had really far-sighted view and were very, but very strong and brave! Because so far they have been falsified bonds that do not exist, had never existed, and will never exist! Deploying at least extraordinary means and burying boxes and boxes of bonds for decades, just hoping that the day it would all be dug up, by the merest chance, they would finally be universally recognized as the greatest counterfeiters and more discerning smugglers of mankind. And if the Fed warned about the existence of "boxes" of "fake" bonds in the Philippines, what would the Fed say now with the emergence of these new "boxes" of "fake" bonds in China (boxes totally differ from the precedent ones, but we all know that counterfeiters are extremely imaginative persons indeed!)? "Each box of bonds contains 120 large envelopes, in each of these envelopes there is a nominal value of U.S. $ 300 million (10 sets of 3 bonds of $ 10 million each), so 3.6 billion dollars per box! And of course, we must take into account not only the face value, but also the interests since 1934!" A descendant of a Chinese high official at the time told me that the Americans had brought to China a dozen machines for printing bonds, and that the machines have printed from 1928 to 1936. According to him, Soong May-ling, widow of Chiang Kai-shek, got her money back for such bonds, mainly owned by descendants of the Kuomintang and of the Chinese Imperial Family. Now is there in some way a connection between this "Chinese Imperial Family" and the very mysterious "Dragon Family" that someone had already spoken about? 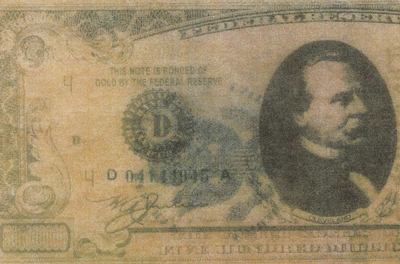 Moreover the machines would have printed from 1928 to 1936 bonds Series of 1934 with a maturity of 30 years: it means they could have been redeemed from 1964. 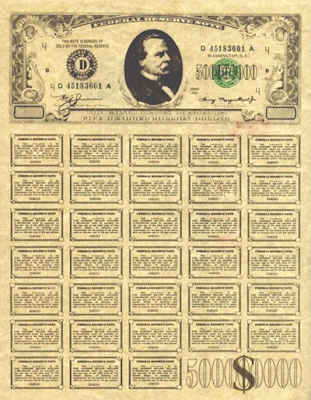 Well, as we saw first, the US Treasury issued denominations of ($100 million and) $500 million during at least 14 years, since these very-high-denomination Treasury notes officially started in February 1955 and officially ended in October 1969. So there is a perfect compatibility between the two dates! 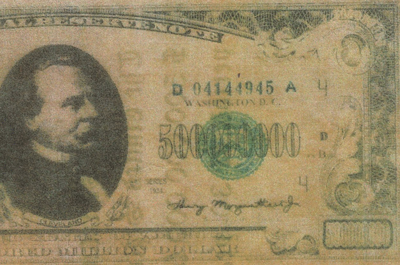 This coupon is for FIVE HUNDRED MILLION DOLLARS $ 500,000,000 shall be payable on the last day of the 30th year of The United States of America and redeemable for the period of 30 years with an interest rate of 4% per annum. Ultimately, the official explanation of U.S. authorities is that the "U.S. Dollar Bonds" and the other "Morganthaus" circulating in Asia are all bogus securities, forged by the CIA in the 30s and early 40s to help Chiang Kai-shek in his struggle against the Chinese Communists. Buried by the Kuomintang generals for decades, they have begun to reappear only recently. And the theoretical goal of these fakes just would be to exchange them against a fraction of their nominal value. But if it is true that the Central Intelligence Agency had brought in China a dozen machines for printing bonds, it means that we are talking about a covert action, and as the CIA stated itself on his website: Only the president can direct the CIA to undertake a covert action. If at the time the President of the United States authorized the CIA, a US government organization, to print "false true bonds" on american printing machines with american security paper brought there for this purpose, shouldn't the actual US government be legally binded to the repayment of these bonds? ... if they will be paid some day, the money will be used for the construction of several hundred hospitals in China. A Memorandum of Understanding has already been signed for it. He also went to its embassy in Beijing, "with the owner of a box and his treasurer to authenticate signatures" affixed to the agreements on the bonds. But if the embassy simply records the documents without judging their content, it's clear that its Chinese partners would have never take such a risk if they believed that the bonds were false, since in China you can be executed because of that! For now, after the big disillusion of Wikileaks (an italian source, particularly very well-informed in Italy, stated that there was something about the Chiasso financial smuggling case in the Embassy Cables leaks, but still I wasn't able to verify it...), I just wonder if Mr. Yin and Mr. Yang will eventually succeed in their affair, and if some day we'll be able to know the truth about these stories!? “Fake” billion US dollars bonds case revived?